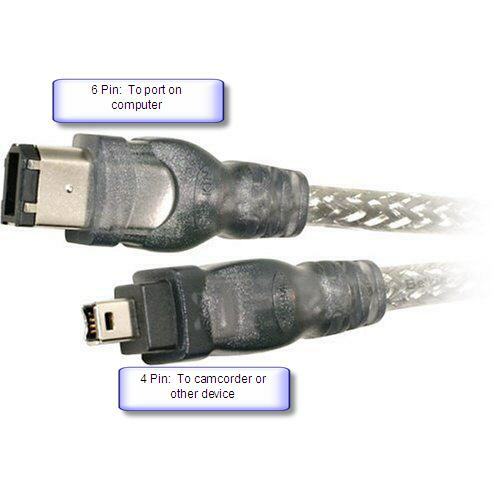 Along with USB, Firewire (also called IEEE 1394 and i.Link) is another popular connector for adding peripherals to your computer. Firewire is most often used to connect digital camcorders, external hard drives, and other devices that can benefit from the high transfer rates (up to 480 Mbps) supported by the Firewire connection. Firewire also has the advantage of being able to transfer power to the device through the same cable that does the data transfer. A disadvantage of Firewire is that cables tend to be more expensive. Although Firewire was originally developed by Apple and comes standard on Macintosh computers, it is also available on computers made by Sony (as i.Link) and other PC manufacturers. Even though most camcorders also include USB 2 connectors, these may only be used to download the digital images many newer camcorders can take. To download video, you would use the Firewire connection. If your computer does not include a Firewire connector and you need to download video from a camcorder, you may be able to purchase an expansion card that will add the ports to the back of your computer. If you have a laptop, you can purchase a PC card that will insert into one of the slots on the side of your laptop to add Firewire ports. In addition to connecting peripherals such as camcorders or external hard drives, Firewire can be used to create a computer-to-computer network. This can be set up in Windows without the need to add any additional software, and can provide a fast way to transfer data across two computers with Firewire connections.